Late summer in the northeast means wild blueberries! There are few pleasures in life as satisfying as picking wild blueberries. It takes time, but it forces you to slow down and appreciate ever little berry. I never get tired of fresh blueberries. I eat them every day while they’re in season, usually with a generous amount of cream and maple syrup. 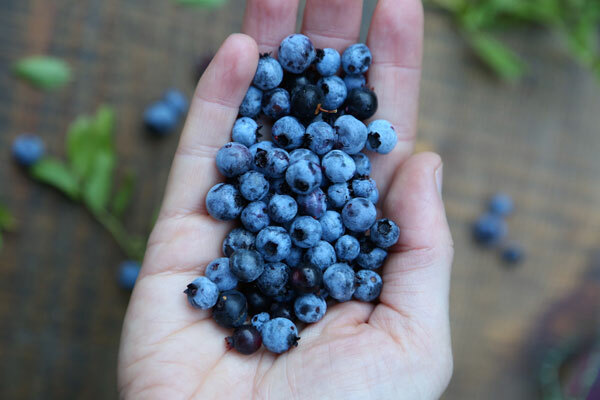 We’re so lucky that our neighbors have a certified organic wild blueberry farm and each year, we order enough to freeze and last us all winter. Last year, we took part in Coastal Mountain Land Trust’s annual free wild blueberry pick at Beech Hill Preserve and I made this blueberry lime layer cake. 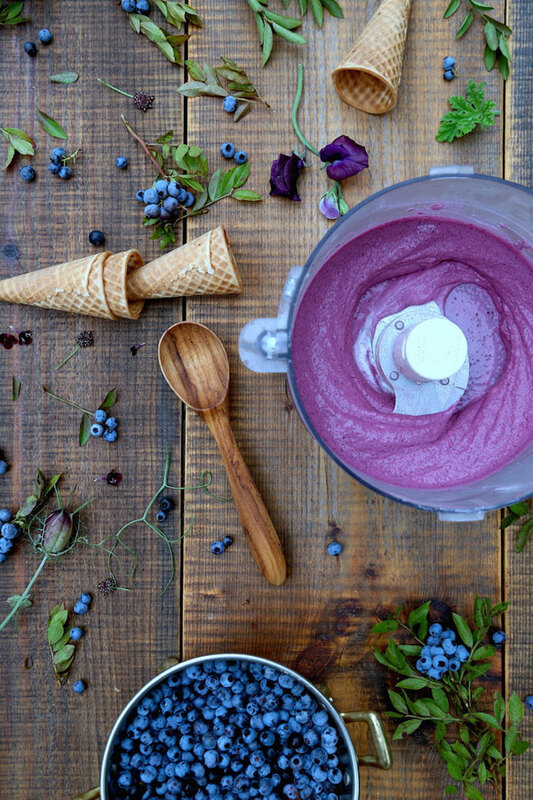 This year, I wanted to make frozen yogurt with our dairy farming friends’ rich and creamy Greek yogurt but there was one problem: I don’t own an ice cream maker. So I looked up alternative ways to make frozen desserts without an ice cream maker and I stumbled upon this wonderful article on Serious Eats. From my readings on the topic, I gathered there are a few things to increase your chances of creamy frozen success without the constant churn of an ice cream maker. Most importantly, there should be very little water content in your mixture in order to prevent ice crystals from forming. Ice crystals = rocky frozen desserts = the opposite of creamy and smooth. There are a few ways to keep ice crystals at bay: using a full-fat yogurt, adding sugar, freezing the mixture quickly, and using some kind of thickener. I experimented with many methods, using ground chia seeds as a thickener, various amounts of sugar or maple syrup, using cooked thawed berries, using fresh berries. In the end, the most simple recipe won the prize, with a few basic steps to achieve creamy goodness. One trick I found especially useful was to strain plain whole milk yogurt overnight, which gives you labneh (basically a very thick yogurt). I learned about labneh from Tara O’Brady’s gorgeous new cookbook, Seven Spoons, and it’s been quite revolutionary in my cooking. I’ve used labneh in so many different recipes, but in this one, it’s especially crucial since it greatly minimizes the water content of the yogurt. Of course, if you use extra thick Greek yogurt, the added straining step is not necessary. A word on choosing the right yogurt and blueberries. 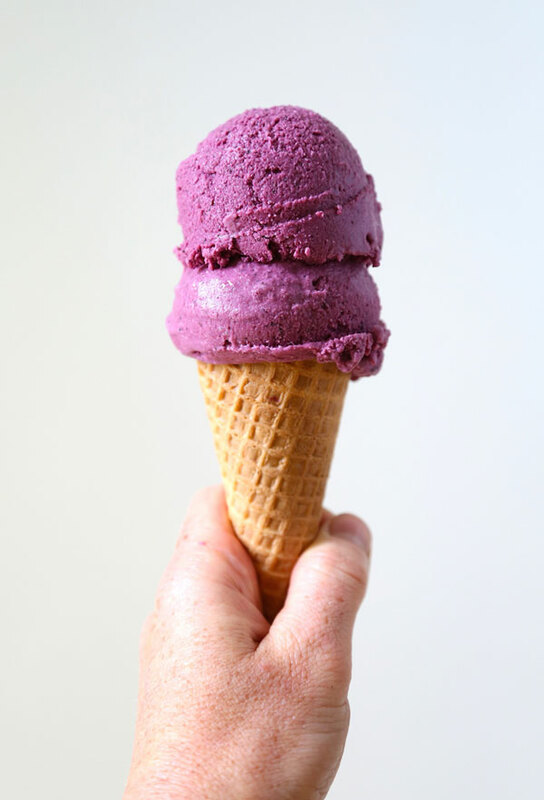 Using wild blueberries will yield a bright beautiful purple whereas using high-bush blueberries will yield a grey-colored frozen yogurt, not a very appealing color. 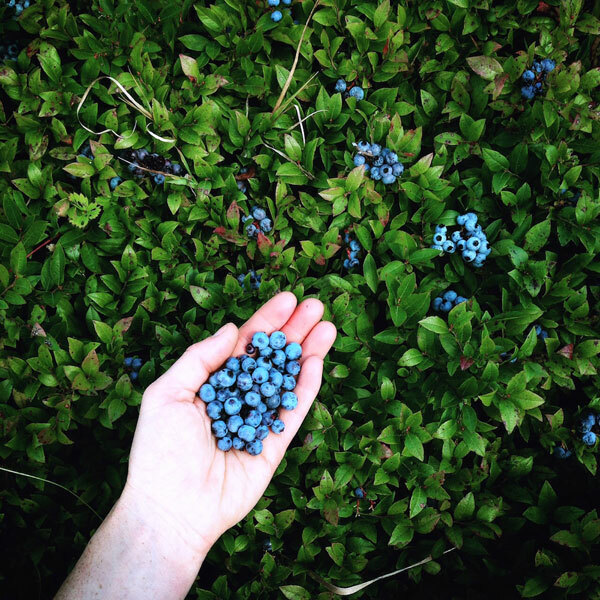 Both are delicious, but for the most gorgeous color, I strongly recommend wild blueberries. Either fresh of frozen will work beautifully though they need to be treated differently and I’ve outlined both versions in the recipe. As for the yogurt, full-fat whole milk yogurt is necessary for this recipe to work properly. Don’t even bother with low-fat, you will end up with a rock. The only way commercial low-fat yogurts work is that they pump them full of thickeners, stabilizers, and sugar. Besides, research shows that it’s not fat that makes us unhealthy, it’s too much sugar and chemical additives. This creamy frozen yogurt is the real thing, just real yogurt, fruit, and a little sugar. I hope you love it as much as I do! 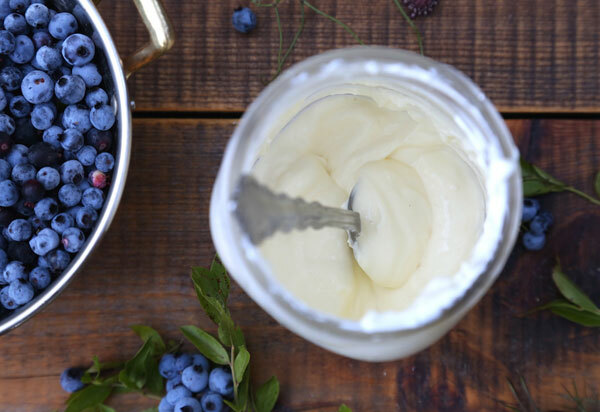 Be sure to use full-fat creamy Greek yogurt or whole milk labneh. To make labneh, place 4 cups of regular whole milk yogurt in a fine-mesh strainer over a bowl overnight to strain out the excess liquid. Discard the liquid. You will end up with thick labneh, similar to Greek yogurt and low in water content, which ensures a creamier frozen yogurt. If using fresh blueberries: wash the blueberries and gently pat them dry. Be sure they are fully dry before using, you don’t want to add any water into the mix. Place all the ingredients except the cream in a food processor. Blend until smooth. Taste and if needed, add a bit more sugar or maple syrup to suit your taste. Blend a bit more to dissolve the sugar. 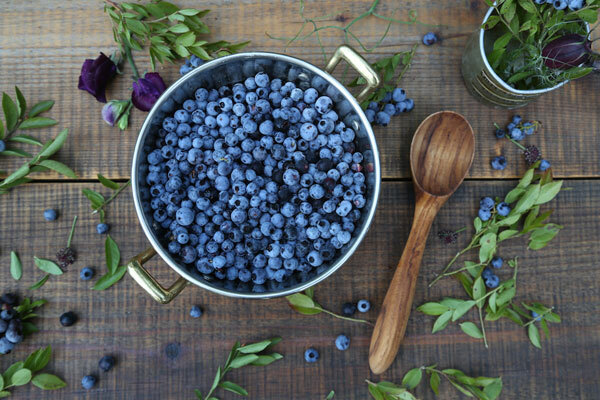 If using frozen blueberries: cook the thawed blueberries and sugar in a small saucepan, simmer-ing for about 10 minutes or until much of the water has evaporated and the sugar has created a light syrup. You should end up with 1 cup of blueberries and syrup (half of what you started with). Allow this mixture to cool before adding to the yogurt and vanilla and blending in a food processor until smooth. Taste and if needed, add a bit more sugar or maple syrup to suit your taste. Blend a bit more to dissolve the sugar. 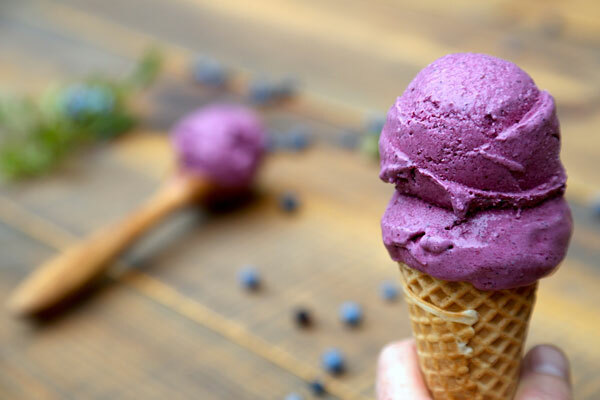 Once you have a smooth mixture (using either fresh or cooked berries), strain out the blueberry skins using a fine mesh strainer and a wooden spoon to obtain a less pulpy consistency (this part is optional). If you have an ice cream maker, cool the mixture to 45F and churn according to the manufacturer’s instructions. 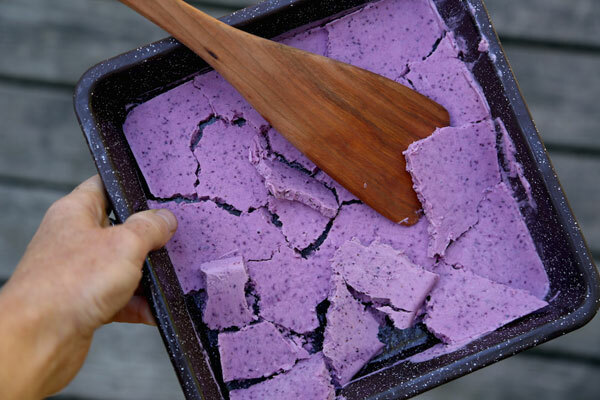 If you don’t have an ice cream maker, pour the mixture into ice cube trays or a large metal cake pan. (Spreading the mixture out thinly on a wide surface area or using ice cube trays helps it freeze more quickly which prevents ice crystal formations). Freeze for at least 4 hours and up to 24 hours, until solid. Remove from freezer, and let the mixture warm slowly by leaving it on the counter for about 10 to 15 minutes. (If necessary, you can dip the bottom of ice cube tray or pan quickly in warm water to loosen). If you used a baking pan, break up the mixture into smaller chunks, using a bread knife or a wooden spatula. Place the “ice cubes” or chunks into food processor and blend until the chunks break up into small sandy bits. While keeping the food processor running, slowly pour in the heavy cream in a steady cream. Gradually the mixture will form a creamy ball with the perfect consistency. Immediately stop blending and serve. If you’ve taken it too far and the frozen yogurt has become too soft, simply refreeze it for another 20 minutes before serving. If you freeze it again for a long period of time, it will harden and you will need to either let it soften on the counter again or repeat the food processor and cream process.